Are you organizing a cycling event? That’s great – but make sure to arrange for cycling certificates beforehand which would be conferred to both the winner and the participants. The official certificates acknowledges the participation and feat of the rider in the tournament. It’s a great way to honor the riders and to instill confidence in them so that they can please the fans with many more of such impressive performances. The cycling certificate templates are any day a great time and energy saver with their readymade certificate framework. This is a brilliant cycling certificate template you have here with the apt illustration of a determined cyclist at the bottom of the page. The geometric background has added an edgy dimension to it. 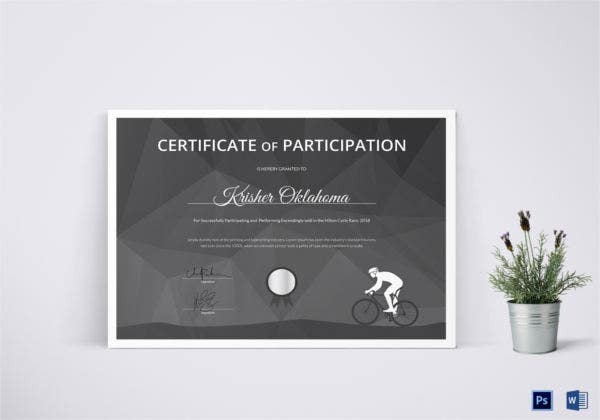 If you are looking for an elegant cycling certificate to reward the tournament champion, this template would be a great thing for you. You can include your organization’s name and logo at the right bottom. The entire template has got a breezy old-world feel with its faded backdrop and the archaic font. The beautiful blue & white cycle takes the center stage and makes the sample a perfect one for a cycling championship. 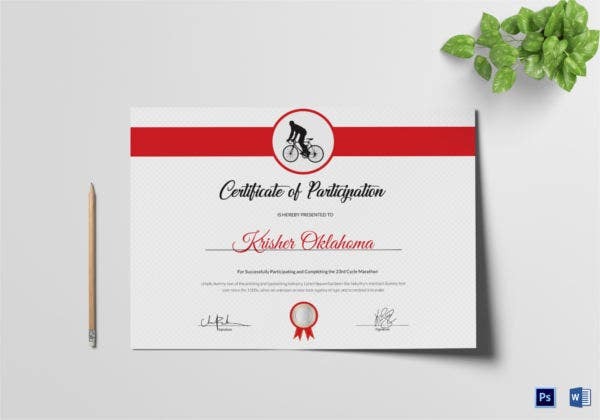 If you are looking for a certificate to be awarded to the participants of your cycling championship, look no further than this elegant white and red cycling certificate template. The illustration of cyclist at the top adds the needed flavor. This template simply steals the show with its brilliant image of a smart determined cyclist in motion that brings up the very dynamic aura of a cycling championship. It’s stylish & edgy. > Who needs a Cycling Certificate Template? A cycling certificate would be needed by any committee or organization that organizes a cycling championship. Whether it’s an esteemed event like Tour de France or your local cycling championship, whenever there is a cycling tournament, a cycling certificate is always needed. In fact, the schools and colleges organizing cycle races would need the cycling certificate templates too. Besides, apart from the committees organizing cycling championships, the cycling training academies would benefit from the cycling certificate templates as well. They are needed to hand out the certificates to students after they complete the training with them. You can also see Netball Certificate Templates. > What is the purpose of Cycling Certificate Template? 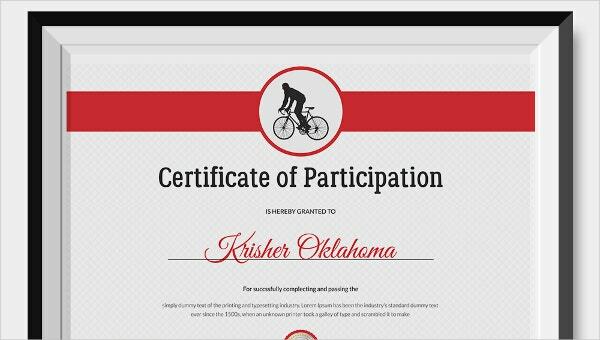 The main purpose of a cycling certificate template is to honor the champions of the cycling tournaments. These certificates act as a written proof of merit of the great cyclists and hence are always treasured by the riders. Your win is never fully recognized unless you are handed over the cycling championship winner certificate which is the formal proof of your victory that you can show anywhere. 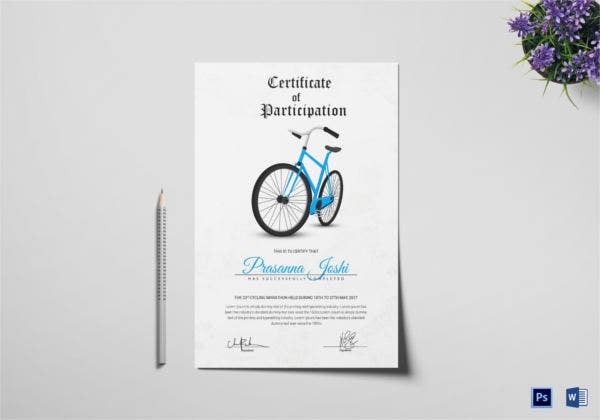 Apart from acknowledging the winners, the cycling certificate templates are also used to recognize the participation of the cyclists in the cycling event. The templates are designed to help you in creating cycling certificates faster without the need to draft everything from scratch. The cycling certificate templates mentioned above would be great when you are looking for the best samples for the certificates of your cycling championships. Each of them carries illustrations of cyclists that have rendered the needed essence of the sport to the overall certificate. They are smart, professional and easy to customize.